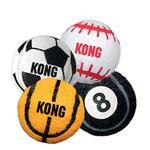 Win some love and games with the KONG Sport Balls Dog Toy! Posted On 12/04/16 by Kathleen R from , Yes, Kathleen R recommends this product! Posted On 08/07/16 by Carla V from Falls Church, VA Yes, Carla V recommends this product! Chico my baby loves to play and enjoys rolling the ball all over the house.